I have a confession to make. I’ve been totally stumped on what to blog about this week. Zilch. Zip. Nada. A big, fat, black hole of nothingness. Totally in the dark…something akin to my world a week ago when we had seven days of no power after our local substation had literally gone up in flames. And even a little something like the start of the new book I’m writing…foggy and sluggish. Which is what I’d thought of blogging about initially—the new book, that is, not the state of uninspiration. But then I decided to think out of the box. I mean, who wants to hear about another new book? Except, my box was black and sunk, and I feared this blog would not see the light of day. As I went about life this weekend, this blog was constantly on my mind. While spring-cleaning (although it’s the middle of winter) my son’s room, I came across all kinds of wonderful memorabilia—letters and cards to my late parents, from myself and my children; invitations to a bridal evening my mother and I hosted for the women of our church over two decades ago—and I thought I could blog on that. Everyone loves a trip down memory lane. But as filled with love as all those memories were, where was the romantic love in that? After all, this is a romance blog. So I ditched the idea. I thought of doing a book review for La Risposta, the final book in A Tuscan Legacy, telling you all of the fantastic job Autumn Macarthur did of bringing this nine-book series to an end. Even though I knew the plot, I was amazed at how Autumn pulled it all together, and I read the book as if I didn’t know the answer to the question about the mysterious paintings that had appeared in every book throughout the series. But then I figured you’re all probably Tuscan-legacied-out, so I chose not to go that route. Later on Saturday evening, I tuned into Smile 90.4 FM on my computer and live-streamed my son being interviewed on the local radio station down in Cape Town, some 1800km away at the tip of South Africa. And for a brief moment, blogging about that crossed my mind. But the only way I could tie that in to a romance blog was the memory it conjured up of a cute romance novel I’d read years ago by Liz Curtis Higgs called Mixed Signals. A book review on that would have been an option, except, I would have needed to reread the story, and there was no time for that. So I’ve come full circle, and decided to blog about what I’d thought of blogging about in the first place—my current work in progress, A Time to Push Daisies. Strange title, you’re probably thinking, but I figured there was no way I could call the third and final book in my Under the Sun, Seasons of Change series book 3, A Time to Die. So I chose to make the title way more light-hearted, but still keeping the idea from this well-known Bible passage. 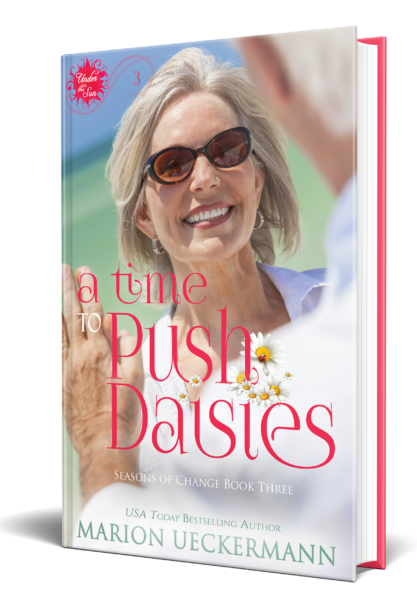 A Time to Push Daisies follows on from A Time to Love (Book 2) which followed on from A Time to Laugh (Book 1). If you haven’t read these first two books yet, make sure you do before tackling Book 3. Although they’re all standalone stories, they will be enjoyed far better if read in sequence. A Time to Push Daisies loosely ties the Seasons of Change series to my current Seven Suitors for Seven Sisters series—yes, the Blume sisters!—in that my hero, Caleb Blume, is the ever so slightly younger brother of Joshua Blume…Magnolia, Rose, Heather, Holly, Clover, Lily, and Poppy’s father. If you’ve read any of the five stories that have been published (and before you ask, Book 6 is definitely planned for Christmas), you might remember the girls’ dad is a horticulturist, growing and distributing cut flowers to florists across the UK. Caleb has also followed in the family flower-growing footsteps, but in a slightly different way. He is a landscape architect and a different kind of hero in that he’s in his early sixties. My heroine is the mother of Jordan Stanson, the TV host/journalist from A Time to Laugh and A Time to Love. I’m going to try my best not to give away any spoilers here for those who haven’t read these books. Through various circumstances, JoAnn Stanson finds herself on a cruise around the British Isles, which is where she meets Caleb Blume, who has had one very close shave to pushing up daisies. This book will be part of the box set, Somewhere Beyond the Blue. This set of six books was inspired when both Autumn Macarthur and myself received positive feedback from readers with our stories, A Time to Laugh and Least Unexpected, which had older couples as the main characters. We realized there was a lack of books for readers who preferred reading romance stories of people in their golden years. We had three criteria for each story that the authors needed to adhere to: the hero and heroine had to be in their sixties; part of the story had to happen on a boat (size was entirely up to the author); and of course, our usual lip-smacking recipes had to appear in the back of the book, referring to the sweet treat in the story. God willing, this set will release around this time next month. I know all the authors are frantically writing and editing. Well, will you look at that? I actually got this blog written. 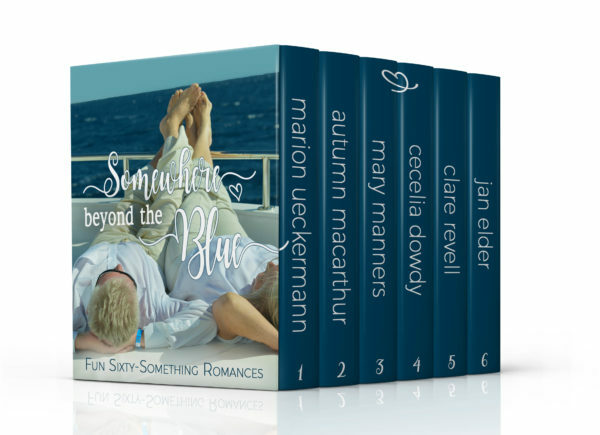 If you’d like the chance to win a an e-copy of A Time to Push Daisies, plus the other five wonderful stories in the Somewhere Beyond the Blue set when it releases toward the end of August, please comment to be entered into the draw. The winner will be announced at the beginning of September. PS, hey, would that make a story- the heroine/hero is looking back through a memory box and stumbles across something written about them…then they meet up somehow?!! LOL. Actually, the beginning of my book for the boxed set, Choose Again, has something similar. Not quite a memory box, but similar. Hi Marion! Glad your power has been restored and you have had the opportunity to reflect on memories. Looking forward to your new release and the boxed set. As a retire I enjoy reading about seniors. Happy writing. I think readers are going to love this set, Renate :) As for the power…it’s dodgy, but it’s more on than off now days, so that’s good. Every now and then, something trips at the station and has to be repaired, then we’re without power for a few hours. They did rebuilt and power up a substation within a week, something that should take months to do. Somewhere Beyond the Blue sounds like a good collection of stories. Two friends of mine from my school days both have a widowed parent in their eighties. These two parents have started a romance with each other. I think it’s so sweet! How adorable, Sherrie! Thanks for sharing. I would LOVE to read a series about romance in the sixties! One of the sweetest weddings I ever went to was a couple who married in their 80’s! Her daughter was married to his son. Another of his son’s was the preacher and married his childhood Sunday School teacher to his dad ! It was awesome! I really enjoyed A Time To Love and A Time To Laugh. I’m looking forward to the final book in the series! I love all your books, and cannot wait to read this one! I am so sorry for what you went through with no power for so very long!! You’re always so positive even when the lights and power was off. I’ve not read these books and they look really good. I think I’m going to be making my TBR planet grow and grow with so many great books to read. I just want to say I’ve enjoyed everything I’ve read of yours and these will be on top of my pile. Marylin, you’re so sweet. So glad to hear you’ve loved my stories…music to my ears :) And really glad you’re bumping Seasons of Change books 1 and 2 to the top of your pile :) A Time to Love ebook is only available in Snowflakes & Snuggles box set at the moment. But at 99c for 6 books, it’s a great buy. Unfortunately, Amazon rules dictate we cannot have a book in a set and publish it in solo if it’s in KU. So, I have to wait until the set unpublishes before I can get my solo ebook out. Would love to be entered to win! Thanks! Hi Marion, I’m glad to know I’m not the only one who gets stumped on what to blog about and whose book beginnings are often foggy and sluggish. I’m hoping inspiration strikes us both in only that God-proferred way that makes everything come together all of the sudden. I’ve been traveling and haven’t been able to read much of InspyRomance lately, but am glad I got to read this one. Looking forward to book 3!